My first thought was to suggest that there was nothing to see here but on reflection a couple things are worth noting. 4.1 & 5.1 concern a warming centre for the homeless and 9.1.1 which concerns the ongoing expansion of the Gardens retirement centre up by Canadore. 4.1 – Petition from Adam Stead. A warming centre for the homeless of Parry Sound. (Ten names on the petition). 5.1 – Adam Stead, resident A warming centre for the homeless of Parry Sound. 9.1.1 – Meadow Street Storm Sewer Replacement. Resolution. That upon the recommendation of Triton Engineering Services Limited, Council accept the quotation from Tower Excavating for the storm sewer replacement on Meadow Street, in the amount of $99,999.51, excluding HST, this quotation being the lowest quotation of four received. 3. That the applicant be advised that the severed lot may need to be rezoned to permit the intended use (an Apartment Building) as this is outside the scope of a SP 26.88 zone. In addition, parking requirements may be deficient if development proceeds as identified on the Notice. 10.2.1 – St. Andrews Parking Lot Agreement. By-law 2018 – 6877. Being a bylaw to execute an agreement with the Trustees of St. Andrews Presbyterian Church for the use and occupation of 54 Seguin Street, known as the St. Andrews Lot, as public parking lot. 10.3.1 – C.P. Station Lease Extension- Festival of the Sound. By-law 2018 – 6878. Being a by-law to authorize the execution of an agreement between the Town of Parry Sound and Festival of the Sound for the rental of the CP Station. 10.3.2 Partnership Agreement – York Professional Care and Education: Sport Leadership Camp. By-law 2018 – 6879. Being a bylaw to authorize the execution of a Partnership Agreement between York Professional Care and Education and the Corporation of the Town of Parry Sound under the Youth Sport Leadership Camp program. 10.3.3 – Deputy Mayor Appointments. By-law 2018 – 6880. Being a By-Law to appoint a Deputy Mayor for the Town of Parry Sound for the 2019-2022 term of Council and to repeal By-Law 2014-6481. 4.3 – Intersection of Isabella & Gibson Streets. The suggestion is the installation of 4-way stop signs. My experience would support the suggestion. It can be tricky turning left from Gibson onto Isabella for the reasons noted in the letter. 10.2.2 – Rezoning Application – Z/18/04 – Louisa Street (Acorn Ridge). The council meeting package contains an extensive review of the proposal and the basis for Staff’s recommendation that the rezoning application be approved. Check out the meeting agenda package at the Town’s website for the full report and recommendation. 4.1 – Downtown Business Association. Resignation of Mike Puro from DBA Board. 4.3 – Dan Ball & Gord Knechtel. Intersection of Isabella & Gibson Streets. Now Therefore Be It resolved that Council direct the Clerk to notify the Ministry of the Environment Conservation and Parks, the Ministry of Health and the Municipality of McDougall that the majority of eligible electors who voted in the municipal election are not in favour of the fluoridation of the Town’s public water supply and that the Town of Parry Sound will not add fluoride to the Town’s drinking water; and Further that the Director of Public Works be directed to complete a Form 2 – Record of Minor Modifications or Replacements to the Drinking Water System and then a Director Notification Alterations to a Drinking Water System form both to be forwarded to the Ministry of Environment Conservation and Parks. 9.1.1. – Financial Variance Report for Q3 2018. Resolution. That Council hereby receives and accepts the variance report for Q3 2018 (September 30, 2018) in Schedule “A” as attached; and Further that Council hereby approves the expenses for Council members for the period from July 1, 2018 to September 30, 2018, as in Schedule “B” attached. 9.2.1 – Urban Tree Canopy and Native Vegetation Policy. Resolution. That in accordance with Section 270(1) of the Municipal Act, 2001, S.O. 2001, c. 25, that the Town of Parry Sound Tree Canopy and Natural Vegetation Policy, as per the attached Schedule A, be adopted. 9.4.1 – Alcohol & Drug Use Policy. Resolution. That Council hereby approves amendment to the Town employee Alcohol and Drug Use policy to prohibit the use of marijuana by employees on Town worksites and during working hours, per the policy attached as Schedule “A”. 10.2.1 – Agreement of Purchase and Sale. By-law 2018 – 6873. Being a By-law to authorize the execution of an Agreement of Purchase and Sale between Nancy Anne Virtue and the Corporation of the Town of Parry Sound. 10.2.2. – Rezoning Application – Z/18/04 – Louisa Street (Acorn Ridge). By-Law 2018-6874. Being a By-law to amend By-law No. 2004-4653 (The Zoning By-law), as amended, for Louisa Street (Acorn Ridge Properties Inc.). Resolution. That the increase in height of 1.6 feet as noted in the Notice of Complete Application and Public Meeting for Z/18/04 – Louisa Street compared to what was noted on the application does not require any additional circulation in accordance with Section 34(17) of the Planning Act. Direction. That staff be directed to discuss and prepare a Pre-Development Agreement with the applicant for Council’s consideration. This agreement will determine the cost for road and sidewalks improvements and determine if and how a cost sharing can be arranged with the developer. 10.4.1 – New Code of Conduct for Council, Boards and Committees. By-law 2018 – 6875. Being a bylaw to authorize the passage of a new Code of Conduct respecting the behaviour of Members of Council in the performance of their duties and responsibilities as elected community representatives and the behaviour of Local Board/Committee members and to repeal by-laws 2012-6138, 2014-6474 and 2016-6597. Some quick thoughts and numbers from yesterday’s Town of Parry Sound municipal election. The only real surprises to be expected was who the two new councillors would be. I picked one with my vote but not the other. I wish both of them the best of luck. Here are some numbers from the past three elections that suggest a considerable degree of consistency in terms of the vote totals. These first two tables summarize the total votes cast and the percent of eligible votes cast for 2010, 2014 and 2018. The percent of eligible votes cast for 2018 is an estimate as I do not have the total number of eligible voters for 2018, but the numbers presented will be very close to the actual. In almost all respects the voting pattern for 2018 was almost the same as for 2010 and 2014. A little more than 50% of eligible voters actually cast a vote. This is a bit disappointing given that it has become much easier for people to vote in the last two elections. Once again, a large number of votes for Councillors were not cast, an estimated total of 2,800 votes were withheld by folks who voted for the mayoral candidates. Speaking to a couple of voters I found that one voter chose to vote for two councillors only in hopes of helping their chosen candidates. The other person used only 5 of their 6 possible votes because they did not have a good sense of who else to support. In 2018 once again, 1,000-plus votes was the target for any individual hoping to be elected to Parry Sound Council. This was despite a total of 14 candidates in 2018 versus 11 in 2014 and 10 in 2010. Looking at the chart below the distribution of votes is almost the same for all three years. 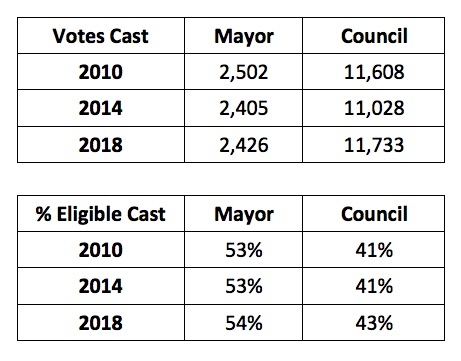 The difference this year was that the number 3 and 4 elected councillors did so with a lower number of votes relative to the earlier years, 1,000 to 1,100 rather than the 1,200 to 1,400 votes of the past. There is a bit of a message there that the candidates need to understand and act upon if they hope to retain the support of the voters. This election reinforces my observation in an earlier post that the votes to get elected as a councillor in Parry Sound are there to be captured, at least 2,800 by my estimate, without taking a vote from anyone else. But that takes much more good work than can be accomplished solely with social media and an unspecific promise of change. There are a surprising number of items on this week’s agenda. None of them are controversial, although several are interesting. 9.3.1– the Request for Quote related to sand and salt provides some insight into how much salt and sand is put down on Parry Sound streets and sidewalks each year. The number is 300 tonnes. That translates to 300,000 kilos (660,000 pounds) or about 100 pounds for every Parry Sound resident. Well, that’s not doing the environment any favours. 9.3.3– Train Whistle Cessation is moving forward with the request to contract with a firm to conduct necessary studies. 9.5.1– Cannabis Legislation is just around the corner and it appears that the Town of Parry Sound is just starting to do the necessary study. I suspect that just as Parry Sound is home to the area beer and liquor stores that we will also be home to a cannabis dispensary. Hmmm, should the requirement that the 3 Bs (booze, banks and bars) be located in the downtown be amended to 3-B and C? Or, since the RBC is moving to the south end and not to the downtown perhaps we can take the banks out of the 3 Bs and simply rechristen the requirement as the BBC rule. 10.4.1– Appointment of Clayton Harris. Our new CAO will be starting this week. I wish him all the best. The Town is in good shape and he can hopefully take us to the next stage. Thanks to Rob Mens for his contributions to getting us to this stage. 5.1 – Amber Gordon, Director of Development, Georgian Bay Forever. Georgian Bay Forever’s Pilot Project: Divert and Capture: The fight to keep microplastics/fibres out of our waters. 5.2 – Parry Sound Seniors Club, Board members Allen Smith, Gurneth Hoddy, Olive Duggan and Hilda Floyd. Requesting an increase in their grant and having a street sign put up advising drivers that seniors will be crossing in this area. 9.2.1 – Decommissioned Paramedic Response Unit (PRU). Resolution. That the Council of the Town of Parry Sound authorize the PRU being decommissioned in 2018 be donated to the Kearney Fire Department. 9.2.2 – Land Ambulance Contract. Resolution. That upon the recommendation of the EMS Advisory Committee the Council of the Corporation of the Town of Parry Sound direct staff to enter into negotiations in January of 2019 with the West Parry Sound Health Centre (WPSHC) for a 4-year extension to the Land Ambulance contract, that will address the Value Added aspects of the service being leveraging of paramedics downtime, Community Paramedicine Initiatives and limiting Non Urgent Patient Transportation; and Further that staff report back to Council on the progress of negotiations by the beginning of February 2019 with a recommendation on proceeding with contracted services or preparing to take the Land Ambulance service in house for direct delivery. 9.2.3 – Consent Application. Resolution. That Consent Application No. B 31/2018 (PS) (Halvorson), be supported. 9.3.1 – RFQ – Gravel and Winter Sand. Resolution. That Council accepts the quotation from Fowler Construction to supply, deliver, blend, and stack approximately 300 tonnes of winter sand per delivery in the amount of $17.52 per tonne, for a total amount of $5,256.00, including tax, for the 2018-2019 year, this quotation being the only one received. That Council accepts the quotation from Fowler Construction for approximately 60 tonnes of Granular A gravel per delivery in the amount of $15.26 per tonne, for a total amount of $915.60, including tax, for the 2018-2019 year, this quotation being the only one received. 9.3.3 – Train Whistle Cessation RFP. Direction. (For Direct Staff Follow-up). That Council direct staff to secure the services of CIMA+ engineering to assess five level train crossings in Parry Sound for the purpose of train whistle cessation as required by Transport Canada, the Railway Safety Act, Grade Crossings Regulations and Grade Crossing Standards; and That staff bring a report back to Council with the results/findings from the engineering assessments and recommendations. 9.5.1 – Cannabis Legislation. Direction (For Direct Staff Follow-up). That the Manager of Building and Planning Services be directed to prepare a report advising on potential Zoning By-Law impacts regarding cannabis. 10.1.1 – 2018 Debenture. By-law 2018 – 6869. Being a by-law to authorize certain new capital works of The Corporation of the Town of Parry Sound (the “Municipality”); to authorize the submission of an application to Ontario Infrastructure and Lands Corporation (“OILC”) for financing such capital works; to authorize temporary borrowing from OILC to meet expenditures in connection with such works; and to authorize long term borrowing for such works through the issue of debentures to OILC. 10.4.1 – Appointment of Clayton Harris. By-law 2018 – 6870. Being a By-law to appoint Clayton Harris as the Chief Administrative Officer/Deputy Clerk and the Alternate Head under the Municipal Freedom of Information and Protection of Privacy Act for the Corporation of the Town of Parry Sound and to amend By-law 2013-6244 and 2015-6568 and to repeal by-law 1998-4000. 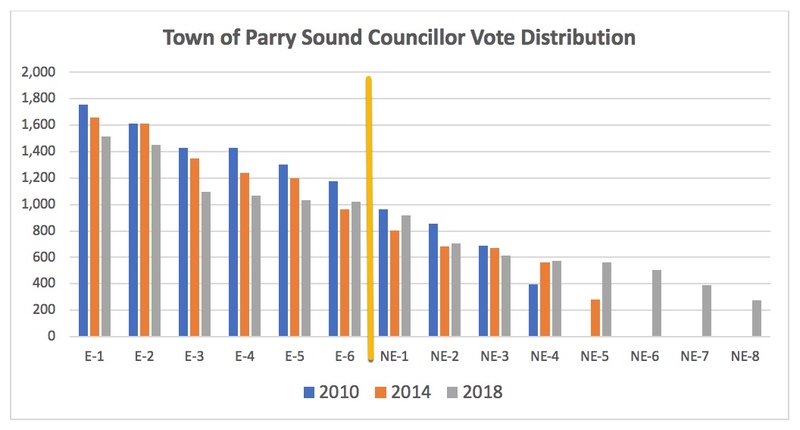 As a follow-up to an earlier post looking at the general numbers of Parry Sound elections, this post looks at what the numbers might be telling us. The Key to Being Elected? Be known, and respected. You don’t need to be a voter’s first, second, third, fourth or even fifth choice. Being number six on every ballot will not only get you elected – it will make you the top vote getter. The bottom line is that to be elected to Parry Sound Council a person has in the past needed to capture about 1,000 votes. Here are estimates related to the votes cast in the past two elections for Parry Sound Council. The table below relates to Council seats not Mayor, and will benefit from some explanation. Eligible Votes refers to the number of eligible voters, according to the voting roll, multiplied by six. Six is the number of votes each voter can use to select candidates for Council. You can’t vote for one person six times, but you can vote for up to six separate candidates listed on the ballot. Votes Cast is the sum of all of the actual votes cast for all of the candidates running for Council in each of the two past elections. Possible Votes is calculated by multiplying the total number of people who actually voted by six. In 2014 about 2,460 people actually cast a vote. That means there were a total of 14,760 available votes for Council (6 x 2,460). In the end, only 11,028 votes were actually cast for the position of councillor. Some 3,732 votes ‘looking for a candidate’ never found one. On average, every person who showed up to vote did not use 1.5 of their votes. The average person who actually voted selected between four and five candidates. I have heard the argument that some folks try to get their underdog candidate(s) elected by voting only for them and no one else. The reasoning is that voting for anyone else might unintenionally allow another candidate(s) to accumulate enough votes to defeat your preferred candidates. I don’t think too many people are that strategic in their voting. The average 4.5 votes cast suggests people know who they want and then don’t have an opinion, or even knowledge, of the rest. If there was considerable ‘strategic voting’ that number might be as low as 3 votes per voter. More likely, in my opinion, is the possibility that you know only four or five of the available candidates and hold them in high regard. You may know a couple of the others, and not like them for any number of reasons. And the rest? You wonder where they came from. Rather than vote your full allotment, you stop at the four or five you know and respect rather than take a chance on an unknown. Election 2018 – Are You a Name or a Person? There are a total of 14 individuals running for the position of councillor in Parry Sound. After covering Parry Sound Town Council for about the past 8 years and serving as a volunteer or board member on more than a half dozen local organizations for that same period of time, and regularly reading the North Star/Beacon Star, I recognize only half of the people running for Council. Four of them are current members of Council who I have often spoken with, one candidate I met socially on several occasions, another I met in my role as a member of a community board of directors, and one other I recognize from their running in the last election. Only one of these three made anything close to a positive lasting impression. The other seven are totally unknown to me. Want to be elected as a councillor in Parry Sound? Be well known and be known for doing good stuff. With more than 3,000 votes ‘ looking for a home’ you don’t even need to take a vote from someone else to be elected. You just need to be known as a good person. That’s done through years of community participation and the type of work that too often goes unrecognized, until it comes to election time. Getting elected isn’t a project that starts two months before an election solely with slogans and attitude. In the next post I will outline what it will take to capture one of my two available votes for the position of councillor. The first four are already decided. A very, very light agenda this week as Council heads towards the election. Nothing caught my attention as being a major issue. 5.2 – O.P.P. Staff Sergeant Mike Gordon and Rob Gibson from the Ministry of Natural Resources and Forestry. Update on the state of Parry Sound Fire 33. 9.2.1 – 2019 Council Meeting Dates. Resolution. That pursuant to By-law 2018-6814, Section 3, paragraph 4, Council approves Schedule “A” as attached, which provides the schedule of dates for the 2019 Regular meetings of Council. 9.2.2 – Updated Code of Conduct for Council, Boards and Committees. Direction. That Council direct the Clerk to provide notice of the new draft Code of Conduct on the Town’s website for public review and comment; and To bring back to Council a by-law for deliberation and discussion to the October 16, 2018 Council Meeting. 10.3.1 – Bobby Orr Hall of Fame Mastercard Sponsorship Agreement. By-law 2018 – 6865 Being a By-Law to authorize the execution of an agreement between Mastercard International Incorporated and the Corporation of the Town of Parry Sound for a Five-Year Event Sponsorship for The Bobby Orr Hall of Fame and Mastercard-Bobby Orr Celebrity Golf Classic (2019-2023).